Often, when manufacturers are sourcing and procuring raw materials, they like to investigate the differences between natural and synthetic alternatives. With some types of raw materials, sourcing natural products is almost always a better option. While there are certainly some good applications for natural rubber, synthetics, such as those manufactured at Mallard Creek Polymers, offer much more versatility of application and are often safer to use. Natural rubber latex is a precise term for the white, viscous, “milky” sap found in the hevea brasiliensis variety of rubber tree. Upon processing, where the naturally-sourced latex is compounded and refined, chemists can optimize the inherent properties of natural rubber latex, such as elasticity/elongation, tear properties, recovery, and waterproofing. A variety of products feature natural rubber latex, like medical gloves, balloons, and tires, to enhance performance properties such as durability, even though tires are manufactured with multiple polymers. For some products that require a heavy concentration of rubber, a manufacturer may try to use a heavier ratio of natural rubber latex to reduce carbon footprint. There are some problems, however, with natural latex harvested from trees. Some people are allergic to proteins in natural latex, and the reaction can be quite severe, sometimes producing an anaphylactic shock. Thus, some people can’t use more commonly-produced medical gloves, but require an alternative, either with gloves where the protein has been extracted (low protein, powder-free gloves) or with nitrile gloves, which are completely synthetic. Also, in certain applications, natural rubber latex is unstable, releasing noxious fumes into the environment. In these cases, outright pollution outweighs any carbon footprint attributes. Emulsion polymers, or synthetic latex, have a variety of applications where they offer a superior alternative to their natural counterparts. In adhesives, emulsion polymers not only achieve a stronger bond, but manufacturers may use less material. Synthetic latex, unlike natural latex, allows for one or two-sided application, while natural latex always requires two-sided application. Pure Acrylic, styrene-acrylic and styrene-butadiene synthetic latex add tremendous value to paints and coatings, delivering films that feature greater strength, flexibility, and excellent water resistance. In addition to the construction adhesives, paints and coatings optimized for the construction industry, processors also add emulsion polymers to increase the adhesion, water resistance, durability, and flexibility of cements and asphalts. For nonwovens, styrene-butadiene emulsion polymers can be incorporated into hydroentangled fabrics (think: wipes) to provide a balance of flexibility and strength. For certain adhesives formulations, chemists can use styrene-butadiene emulsions to extend the formulation that contains natural rubber in order to lower costs. Synthetic latex products find uses in a broad range of applications, with ongoing innovation adding new uses every day for pure acrylics, styrene-acrylics, and styrene-butadiene emulsion polymers. Not only is synthetic latex incredibly versatile, it’s also superior to its natural counterpart in most applications. Perhaps the best attribute of emulsion polymers is that when added to a formula, they can achieve a variety of goals for improving products: increasing adhesion, water resistance, durability, flexibility, strength, and as extenders of natural rubber, as needed. 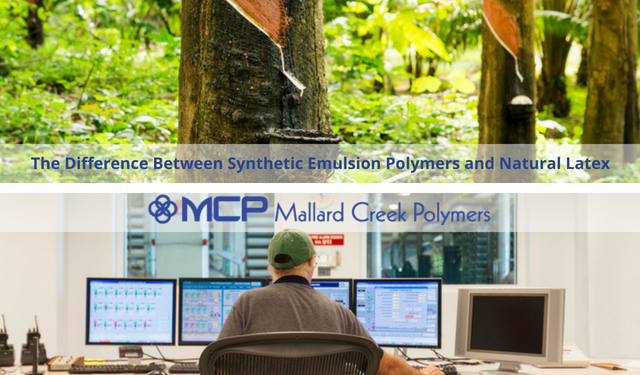 For more information on our lineup of emulsion polymer products at Mallard Creek Polymers, contact us today.